In Florence, at the very end of the street on which Antonio Neri spent his youth, Borgo Pinti, was the residence and estate of the Archbishop. Beyond were the city walls and the enormous wooden doors of the Porta Pinti gate (115 foot, or 35 meters tall). Just on the other side of the gate, which in Neri’s time was normally closed and guarded, once stood the San Giusto alle Mura monastery, built in the thirteenth century. Despite the similar name, there is no connection between the Ingesuati monks of San Giusto and the modern order known as the Jesuits, which was not formed until 1534 and recognized by the Church in 1540. The monks at San Giusto were famous for the stained glass windows they made; hence one of numerous theories that the street name 'Pinti' may be a contraction of 'dipinti 'or 'dipintori' (paintings or painters). Using their own glass furnaces, the Ingesuati monks provided windows for the Neri family's church Cestello and for Santa Maria del Fiore among other churches. They also ran an art school and were famous for making the color pigments used by painters, producing a coveted ultramarine blue. Their customers included the likes of Leonardo, Michelangelo, Botticelli, Del Sarto, Ghirlandaio and Filippo Lippi. Apparently, the Ingesuati's artistic devotion was not matched by their religious observance. In his Lives of the Artists, Giorgio Vasari recalls the less than complimentary sentiments of the monk's own in-house chaplain, a certain Servite monk named Fra Martino. He notes that the monks do not read Mass, and that they, "do nothing but say paternosters ['our Father...'], make glass windows, distill herbs for sweet waters, dig their gardens, and perform other works of similar kind, but do not study or cultivate letters." 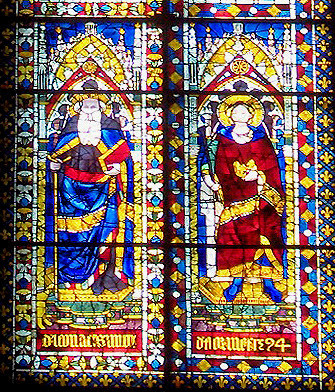 Glass is also a great ornament to God's churches since, among other things, many beautiful windows are made, adorned with graceful paintings, in which the metallic colors are so intense and vivid that they seem like so many oriental gems. This post first appeared here in a slightly shorter form as "Glass Monks" on 30 September 2013.